The “goldilocks” paradigm was back on Friday with the US employment data coming in “just right” for February. While the biggest number of new jobs were added in more than 18 months, a slowdown in wage growth pointed to only a gradual increase in underlying inflation. 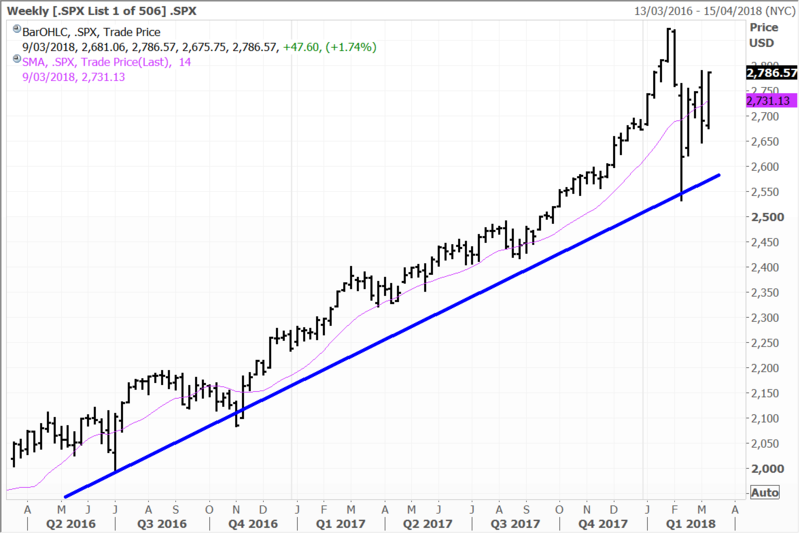 Coupled with the news that President Trump appeared to have made a breakthrough on North Korea, the market rallied hard, with the S&P500 and Dow Jones lifting around 1.8% and the Nasdaq climbing close to 2%. The Dow Jones Transport index soared more than 2.6%. We called Trump’s election very early before he even won the Republican nomination. Today I’m calling his “second term”. He will get re-elected no question. I don’t just believe this because I’m a “Trumplican” – but because politics has a direct bearing on the stock market. The President – rightly or wrongly – has connected with the American people in a way that previous Presidents have been unable to since Kennedy and Reagan. I would even go as far to say that Trump – because of his apathy towards the media – is actually quite unique if you consider the fact that his score card over the last 12 months is impressive. Tax reformation, North Korea, and an impending infrastructure revamp set him apart from the previous four presidents – Bush, Clinton, Bush and Obama. A major negative is he has yet failed to take on the NRA – but this was equally true of his predecessors, but don’t rule out a full reformation of the NRA in his second term when he has nothing to lose. Fakes news or no fake news, left or right, it doesn’t really matter, what does matter is that Trump is ‘apolitical’ in an age where “political correctness” has stifled policy. Apathy as it relates to politics is “in”. The politicians (and most probably the media also) will be the last “tribes” to understand and get this. I think the landscape as it relates to politics has already changed and we will see this “come through” in the next elections in the developed world. Anyway, I’m putting my money down now on Trump for a second term whilst the odds are skewed. With Friday’s close the S&P500 has pushed convincingly back up above 2,700. While new record highs maybe elusive in the very near term, I believe we can probably rule the correction that began in February, as now being over. New record highs later in the year are a distinct possibility as the US indices extends their bull market advance. North Korea was always going come to the table and negotiate. Just as the “tariffs” will be resolved amicably and with little disruption to the markets. The Labor Department confirmed on Friday that nonfarm payrolls jumped by 313,000 jobs in February boosted by the largest rise in construction jobs since 2007. The payrolls gain was the largest since July 2016. Data for December and January were revised to show the economy created 54,000 more jobs than previously reported. The large jump in nonfarm payrolls now virtually guarantees that the Federal Reserve will increase interest rates by 25 basis points at the March 20-21 FOMC meeting. What the market liked on Friday was the fact that despite the strong nonfarm payrolls data, wage growth remains sluggish. While the Fed has flagged three rate hikes this year, I still think it will be four as inflation heats. Average hourly earnings edged up just four cents, or 0.1%, to $26.75 in February, a slowdown from the 0.3% rise in January. That lowered the year-on-year increase in average hourly earnings to 2.6% from 2.8% in January. The unemployment rate was unchanged at a 17-year low of 4.1% in February for a fifth straight month as 806,000 people entered the labor force in a sign of confidence in the job market. The average workweek rebounded to 34.5 hours after falling to 34.4 hours in January. The strong employment data was underpinned by the construction sector, which added 61,000 jobs – the largest jump since March 2007. Manufacturing payrolls increased by 31,000 jobs while retail payrolls jumped by 50,300, the largest increase since February 2016. US stocks rallied Friday on the much stronger than expected job growth in February. Financial stocks were some of the stronger performers Friday and the NYSE Arca Broker/Dear index rose 2.5% to hit a record closing high. Transportation stocks also surged, with the Dow Jones Transportation Average up 2.6%. The railroad operators Norfolk Southern and Union Pacific rallied. The Philadelphia Oil Service Index gained 2.2% on the back of higher crude oil prices for April delivery. Retail, chemical and semiconductor stocks also fared well on what was a day of broad-based gains. Among individual stock movers, technology giants Apple, Baidu and Google-parent Alphabet gained 1.7%, 2.5% and 2.8% respectively. Apple supplier and fibre-optic cable leader Corning rose 2.0%. Video game developer Activision Blizzard gained 1.8% and Take-Two Interactive advanced 2.7%. Logistics titan FedEx added 3.0%, while homebuilder Lennar gained 1.9%. Online real estate portal Zillow Group tacked on 2.7% and Wynn Resorts surged 5.5% on the back of a favourable settlement with Universal Entertainment Corp.
Shares of Google-parent Alphabet surged 2.8% in trading Friday. The technology titan is expanding its tentacles into a wide range of other areas besides its core search advertising business and the self-driving unit Waymo will start testing a fleet of autonomous freight trucks in Atlanta this week, taking deliveries to Google’s data centres. The company has been conducting self-driving tests for trucks in California and Arizona over the past year but the plan with the new test is to deepen the understanding of how to integrate the trucks into their distribution network according to Bloomberg. The trucks have a back-up driver in the cabs to take control if needed and monitor systems. The race to get driverless cars and trucks on the road is heating up around the world, with Google and Baidu among the global leaders on the technology side. Google’s core business is thriving and throwing off enough cash to fund a diverse range of other businesses. Investors have taken note and the shares are up 33% over the past year and have been long-time strong performers for the Global Opportunities and US managed account portfolios. Baidu and Wynn Resorts are held in the Global Contrarian Fund. Apple, Alphabet, Activision Blizzard, Corning, FedEx, Lennar and Zillow are holdings in the managed account portfolio. Take-Two is recommended by the research team. Soft economic data subdued trading in European stocks Friday, with pan-European Stoxx 600 ticking up 0.43% for the day, while the Euro Stoxx 50 index of eurozone blue-chip stocks added 0.21%. Germany’s industrial production contracted unexpectedly. Industrial output dipped 0.1% month-on-month in January, versus expectations for an increase of 0.7%. Still, the depth of the decline was slower than the revised 0.5% fall logged in December. Exports decreased 0.5% on a monthly basis after being fat in December. Imports fell 0.5% which was more than the expected minus 0.2%. The trade surplus was effectively flat at a seasonally adjusted €21.3 billion. France’s industrial production slipped more than expected in January, down 2.0% compared to its 0.2% gain in December. Among stock movers, in France geoscience company CGG surged 4.7% after its 4Q17 net loss narrowed from a year earlier. Media company Lagardere tumbled 7.3% after reporting disappointing annual results. Travel technology company Amadeus IT Group gained 2.7%, consumer staples giant Danone added 1.4%, pan-European stock exchange operator Euronext rose 0.8%, Heidelberg Cement advanced 1.0% and Telepizza finished 1.8% higher. Amadeus, Danone, Euronext, Heidelberg Cement and Telepizza are holdings in the managed account portfolios. Roadside service company AA rose 4.1%, partially recovering from its 7.5% tumble on Thursday when it was reported the company was being sued by a former Chairman. On other side of the coin, media group WPP continued to slump, down another 2.1%. The advertising company has faced a lot of selling pressure on concerns of the shift in marketing preferences. Among miners, Fresnillo rose 2.4%, BHP Billiton gained 2.3% and Glencore closed 1.8% higher. Insurer esure Group advanced 1.6%, Moneysupermarket tacked on 2.4% and consumer staples group Reckitt Benckiser gained 1.0%. Asian stocks generally closed higher on Friday as investors found US trade tariffs to be less onerous than originally feared and geopolitical tensions eased. Japan’s Nikkei futures are pointing to a 500 point gain today. North Korean leader Kim Jong Un offered to halt nuclear testing and asked for talks with Donald Trump, who expressed his acceptance. The Nikkei finished up 0.47% higher, after being up as much as 2% earlier in the day. The Bank of Japan (BOJ) kept interest rates unchanged and gave no indication of when it will begin winding down stimulus. Exporters and insurers were strong performers on the day, while defence and steelmakers were laggards. Household spending in Japan rose an annual 2.0% in January, topping the forecast for a 0.8% decline. Touch screen technology leader Nissha surged 3.6%, while air conditioning giant Daikin Industries advanced 1.7%. Video game developer Square Enix gained 1.3% and robotics expert Yaskawa Electric added 1.5%. The big banks Mizuho, Mitsubishu UFJ and Sumitomo were little changed in trading. The benchmark Hang Seng index closed 1.11% higher. Insurer PICC Property and Casualty surged 3.9%, while oil and gas major CNOOC advanced 2.0%. Social networking giant Tencent Holdings added 0.9% and the Macau casino operators, Sands China, MGM China and Wynn Macau made small gains. CNOOC, MGM, Sands and Wynn Macau are held in the Global Contrarian Fund. Tencent and PICC are holdings in the managed account portfolios. Disclaimer: The Fat Prophets Global Contrarian Fund declares a holding in Baidu, Heidelberg Cement, Telepizza, BHP Billiton, Nissha, Mizuho, Mitsubishu UFJ, Sumitomo, PICC, CNOOC, Sands China, MGM China and Wynn Macau.